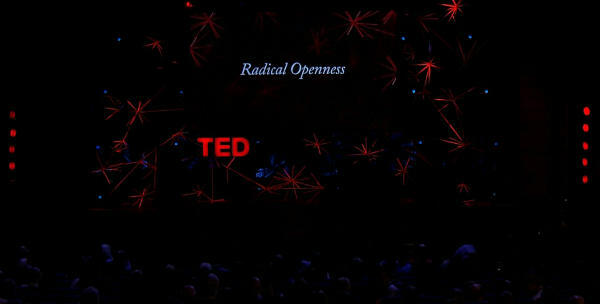 It's now time for my summary of TED global 2012, themed "Radical Openness". The point here is not to make a play-by-play of every session, but rather to show what I've really liked, and to start interesting conversations on my blog, I hope ! For more info a particular talk, you can go to blog.ted.com. The first session of the day openned with a suprise guest performance by Jonathan Batiste (@JonBatiste), the National Jazz Museum in Harlem Co-Director. What do we mean by "openness" ? The author Don Tapscott (@DTapscott) took the stage to shed some light on the subject. Today's Internet is a global computer, that the "net generation", hundreds of digital natives, programs every day. But our open world is becoming so much more, social media is becoming social production, it allows so much more collaboration, transparency, sharing, and empowerement/freedom. In the Arab Spring for instance, teens were using social media to hunt down enemy snipers, or to coordinate makeshift ambulances and clinics. We used to only share knowledge, but now we can network our intelligence, and collaborate in a sort of emerging global consciousness. This inspiring talk was followed by the words of Shyam Sankar (@ssankar), who expressed his vision for the future of artificial intelligence, a future not of computers taking over, but of cooperation between mind and AI. This is the vision of J. C. R. Licklider, a vision of "intelligence augmentation", of a man-machine symbiosis. 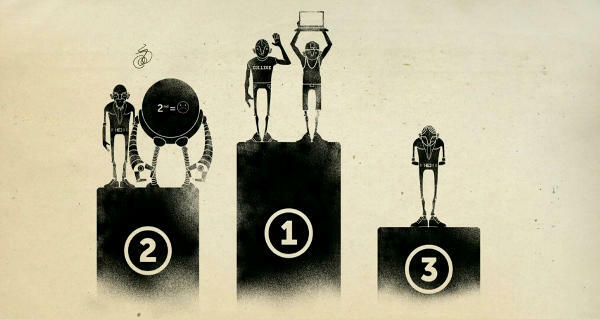 In a chess tournament in 2005, where human players could partner with computers, the winner wasn't a grand master with a super computer, but two average players, with average computers : a good cooperation is more important than raw power of the minds. In order to solve a problem with computers, the most important thing becomes reducing friction in the mind-machine interface. This is especially relevant in today's "big data" world : To catch cheaters on Paypal, or terrorists online, you cannot solely rely on computing power. By looking for paterns, computers can catch all but the most intelligent enemies, they need the non linear thinking of a human mind. The following talk focused on another famous "critical crossroad", China's future. The journalist Robyn Meredith (@RobynMeredith88) gave the audience a great lesson in China's history, and its dream for the future. Foreigner have always had a dream for China : to sell a billion of everything to the chinese, making giant amounts of money in the process. But China's dream is different ; after lifting more people out of poverty in 35 years than it has ever been done before, they have become the factory to the world. This allowed China to become today's 2nd largest economy, but they were still victims to the global financial meltdown, when everyone started to buy much less manufactured goods. Noone can ignore China. While the US remains the dominant military power in the world, China is quickly becoming the most important trading partner. Australia avoided the recession by becoming china's minesshaft (this sounds dirty). Today, Beijing wants its people to save less and spend more ; happy people means that the communist party can stay in power for longer. But this is not the west's dream : it is chinese companies that make most of these products, as they know best what the population wants. In the comming years, we will have to pay attention to China's dream for itself. Robyn Meredith's talk was followed by a short video by Jason Silva (@jason_silva), a "tech filmaker", on the topic of radical openness. While his video was really beautifully done, it was a bit long, and felt like Jason was "name dropping" a bit, quoting famous author after author. Find more of his work on vimeo. He was followed by Raghu Dixit (@Raghu_Dixit) and his band, who quit his job as a microbiologist 15 years ago, to become an Indian folk rock star. I wasn't really into it at first, but his music grew on me . It's really fun and full of energy, don't hesitate to search for him on youtube. To close this session, the TED stage welcomed James Stavridis, NATO's Supreme Commander (now that's a title !). He tweets under @StavridisJ. The point of his talk was that we need more "bridges than walls", in order to defend the global goods, which are threaten daily by various traffics (drugs, weapons, even people), and incresingly by cyber attacks. "Building bridges" means for instance that NATO teaches soldiers in Afganisthan to read & write, that the red cross has two war battleships, outfitted to be mobile hospitals. His final point was that we need some sort of "open source security", and that military force is not an "on & off" switch, but a rehaustat. This session was all about the "maker" movement. 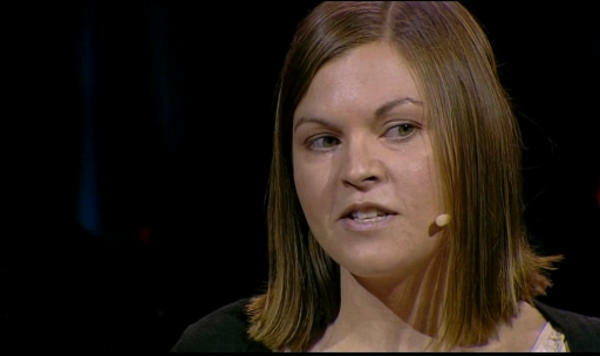 And started with Ellen Jorgensen (@FeyScientist), a biologist. Wait, what ? DIY … biology ? Yes ! Ellen mentioned that more and more biology hacker spaces are created all over the world, where amateurs can try "biohacking". While this sounds a bit scary, she did mention that they are used to it by over dramatisating journalists, who "overestimate our capabilities and understimate our ethics". In a DIY biology lab, you could explore your ancestry, test the products you buy at the supermarket, even find out which dog is leaving poop on your front step, through DNA tests ! From biology we went next to electronics, with a presentation of the Arduino harware by one of it's creator, Massimo Banzi (@MBanzi). 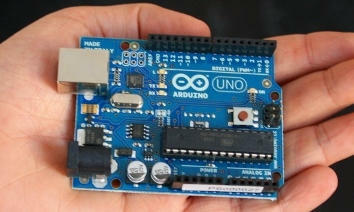 The Arduino board is open source hardware, meaning that anyone can build it, reimagine it, use it, without having to ask for permission. Massimo Banzi mentionned some amazing electronics projects, which is just the tip of the iceberg. 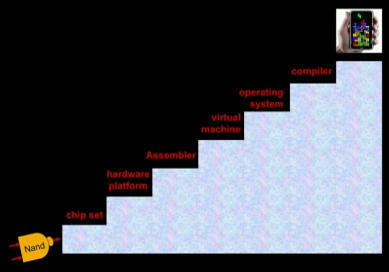 Hardware becomes a piece of culture that anyone can build upon, like a poem or a song. for more info on the platform, you can check out @arduinoblog, the Hack a Day blog, Make magazine, arduino.cc, … there are hundreds of websites on the topic ! Massimo Banzi was followed by Catarina Mota (@Catlx), a TED fellow, who talked and showed some "smart materials", which are becoming increasingly prevalent around us. We know have conductive paints and inks, plastics that change shape, even fabrics that light up. She is the founder of openmaterials.org (@openMaterials), where she offers open knowledge of such materials. Tom Rielly (@trielly) came next on stage, to tell us a bit more about the fellows program that TED offers. The TED fellows work on amazing projects, such as Max Little, who created an algorithm that can diagnose Parkinson's disease using the voice alone ! The maker movement is amazing. Ordinary people are starting to be able to create things that used to be only possible in huge factories. 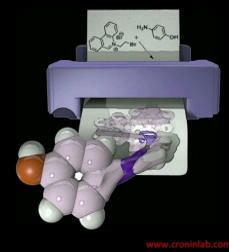 To talk about the world of DIY chemistry, Lee Cronin (@LeeCronin) showed his work trying to "app" chemistry, even imagining a "printer" that could print molecules. Imagine being able to print at home your own medicine, tailored to your own genome ! Of course downloadable drugs makes us think of the weird future world we are creating : if we can print drugs at home, what about piracy, counterfeit goods, illegal drugs ? "The future seems to be already here" is what I thought when Matt Mills and Tamara Roukaerts came on stage to show what their software, Aurasma (@aurasma) is capable of. Using a standard smart phone, you can point at something in the real world, and the software will augment it with content from the internet. Paintings and newspapers become videos, billboards become 3D ads, computer hardware shows its own setup instructions… I want this on my Google Glasses ! The applications for this technology seem endless. You can even try it right now, check out blog.ted.com. The session then focused on more "traditional" makers, the sculptor Antony Gormley or the musician Kathy Hinde. 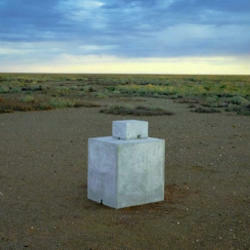 Antony Gormley (@AntonyGormley) works on "space", such as the space our bodies occupy all the time. He thought a lot about it, and created various pieces of art to explore that concept. He uses a lot of different materials, even light and water vapor. You may think that sculptors deal with matter, objects, bodies. What I care most about is making space. On the other hand, Kathy Hinde is a "piano creator", she mixes videos from nature with prepared pianos, creating innovative pieces of music. Her work is intersting, but a bit too "out there" for me. The next speaker, Boaz Almog, got stuck at customs (which seems to happen at every TED event ), so he got moved to Session 7, and the session closed with the words of Jamie Drummond (@drumjamie), who co-founded the advocacy organization ONE. His talk was focused on the United Nations Millennium Development Goals, a set of goals for developing countries, to be reached by 2015, with the help of the richest countries through trade reform and the forgiving of debt, what we call "smart aid". The good that has come from these goals is amazing ; 5,000 children are saved every day !! And yet this is not on the news. Smart aid is amazing, people need to see those results ! Now that we're almost at the 2015 deadline, should we change the Millenium Goals ? What do we want to focus on, gender equality, the fight against corruption ? Jamie Drummond believes we need a crowdsourcing campaign, to ask everyone what goals we need to focus on, and to follow their advancement. The world is really getting better. You can watch this inspiring talk on ted.com. The last session of the first day focused on education, and opened with a beautiful video of an osprey catching salmons and other fishes. See it on youtube. 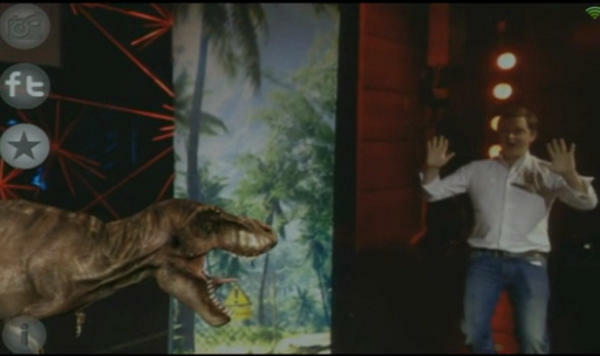 A video by arkive.org (@ARKive). The first speaker was Daphne Koller, a Professor in the Department of Computer Science at Stanford University. She is also one of the founders of Coursera (@coursera), an online education platform. She recognize that most people in the world do not have access to higher education, especially from major universities. In the US, education costs keep rising rapidly (see NPR's Planet Money on that topic). Stanford now offers eleven courses online on computer science topics, for free. Koller talked about the experience of opening to the world the first few courses. Those classes aren't just a video of the course. They include video, examples, homework & tests. At the end of the class students get a certifacte from Stanford. The first three classes had more than 100,000 enrollers, which is an amazing reach for any professor. Having this many students is also a challenge : to grade that many tests, they need to be multiple choice, to allow grading by computer, even if they also experimented with self- and peer-grading, which give suprisingly good results. On the other hand, having a large number of students allows teachers to see, on a graph, that 2,000 students gave the same wrong answer on a particular question, for instance, showing that there's a problem in the teaching of that particular concept. 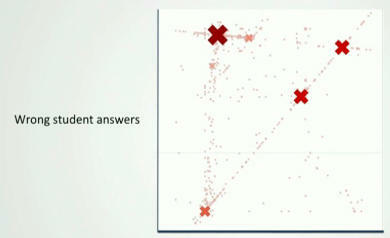 The professor can then make an additional video, sent directly to the students who got it wrong ! Having a digitalised curiculum also allows each student to have a personalised experience : In addition to the course's content, refresher and optional modules are available. Keeping on the topic of computer science, her talk was followed by Shimon Schocken, who designed a course, completly open and free, online. 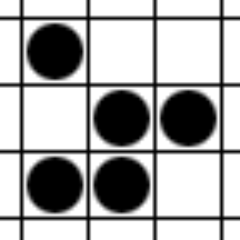 The aim of this course is to make student build their own computer, from a single logic gate, a "NAND", and finishing by programming a game of Tetris, or Pong, on their new machines. Your own computer in 7 easy steps ! Schocken also creates cute "apps" for teaching K12 math on ordinary tablet, where the aim is to let children discover geometry principles, through exploration. He was followed another educator, neuroscientist, and artist, Beau Lotto (@BeauLotto). Beau talked about the link between teaching, play, and science. 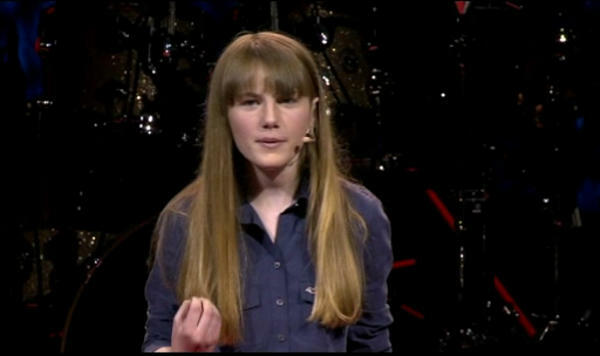 He was accompanied by Amy O'Toole, a 15 years old student, the youngest person ever to talk on the TED stage, and one of the youngest published scientists ever. In her cute english accent, she explained that her class learned the scientific method, and then proceeded to test a theory about bees. Theory, experiment, writing, everything was done by the kids, which is why it was rejected for publication at first (the figures were in crayon :)). After more time than it took to do the actual science, the paper was finally published, and is available online at lottolab.org. Eddie Obeng, a business educator, spoke next. He may be the fastest TED speaker I've seen :). His talk, on the new rules for businesses, was interesting but not amazing, I don't remember all of it. 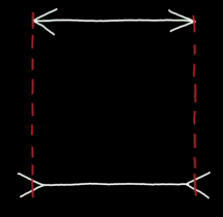 The lines are not the same ! Well that's just mean. When you think about it, if your family vacation was organised like most enterprise projects, ou would end up kilometers from your destination, having lost both kids and luggage, and having spend more than twice your estimated budget ! The second to last guest to the TED stage was the novelist Karen Thompson Walker, with a talk about fear and imagination. She told the story of the shipwreck of the whaleship Essex (1820), where the survivors had a choice between three destinations, each with it's own possible dire conclusion. We often say that fearfull children have a "creative mind" : fears are stories, and most visionaries know that they have to listen to them, in a kind of "productive paranoia" ; sometimes your fears do come true . If you think about it, we often listen to the wrong fears, the most vivid ones, while we ignore more subtle ones, such as cancer or climate change. 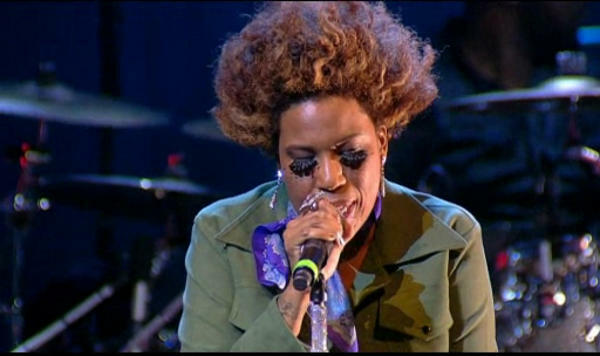 The day ended with an amazing performance by Macy Gray (@MacyGraysLife), the famous singer & songwriter. I try to say goodbye and I choke, try to walk away and I stumble.